As far as pomp and circumstance go…well, it was no 2005, when somehow I found myself on the field during the Red Sox ring ceremony. (At one point, Larry Lucchino glanced over at me and gave me a “what the hell are you doing out here?” look. I had no good answer.) In fact, I’m sympathetic to those fans who seemed to feel that the ’67 squad got short shrift during the pre-game, on-field ceremony. (And yeah, I thought Yaz, the Hawk, et al., could have gotten individual shout-outs as they ambled onto the field.) 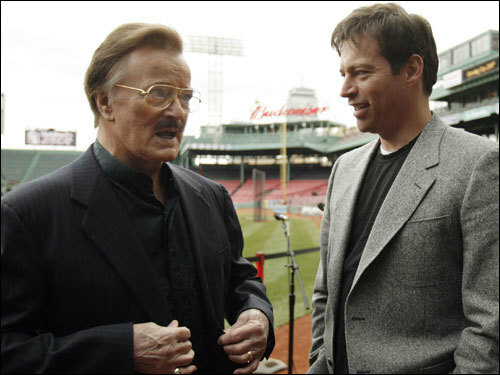 But really, how can anyone complain when Robert Goulet — I’m sorry, Lawrence’s own Robert Goulet — is on the field, warbling “The Impossible Dream”? (A quick aside: as inspiring as 1967 was, and I’m fully in the camp that believes that that squad is more responsible for the region’s enduring Red Sox mania than anything else, has any team had a lamer anthem then the a hit song from the Broadway smash “Man of La Mancha”? “Welcome to the Jungle” it’s not.) Goulet’s a professionally trained voice man, and I’d much rather see him out there than a dubious ruffian without the chops…because when a professional gets his mitts on a song, that’s when it really takes off. The one thing I regretted was that we didn’t get to hear Goulet croon, “I like it when you call me Big Papi — throw your hands in the air when you think you’re a player…Papi.” For that, you’ll need to pick up your copy of “The Coconut Banger’s Ball.” It’s well worth it. I know you can be a word/grammar guy, so…isn’t it short shrift?